I'm heading to central Mexico today. The city of San Luis Potosi claims this dish as it's own, but I think the French may have had their fingers in the pie. Could it be that all cultures have their own version of bechamel? This wonderful dish uses poblano chilies to flavor a bechamel sauce and produce a gratin that is company worthy in minutes. The original recipe calls for Mexican crema, butter and a lot of cheese, but I've lightened it for today's more heath-conscious cooks. 1) Preheat oven to 350 degrees F. Coat an 8 x 11 x 2-inch baking dish with oil or nonstick cooking spray. Set aside. 2) Use a mallet to pound chicken breast halves to a 1/4-inch thickness. Sprinkle both sides of chicken with salt and pepper. Set aside. 3) Remove stem, seeds and membranes from the chile. Place chile in a blender. Add 1/4 cup milk. Puree. 4) Melt 1 tablespoon butter in a small pan over medium-high heat. Add flour and stir until smooth and lightly brown. Stir in chile puree. When smooth, add reserved 1/4 cup milk, sour cream, lime juice and zest and nutmeg. Stir constantly over low heat until mixture thickens. Add salt to taste. 5) Melt reserved 1 tablespoon butter in a large skillet. Stir in vegetable oil. Place chicken in skillet and saute over medium heat for 2 to 3 minutes per side. Transfer to prepared baking dish. 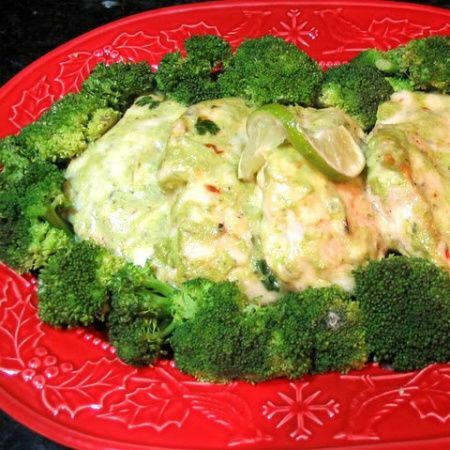 6) Cover chicken with Poblano sauce, sprinkle with cheese and bake in upper-third of oven for 10 to 12 minutes. Serve hot. Yield: 6 servings. What a beautiful blog you have! The poblano chicken is just gorgeous, not to mention the blueberry dessert below. Love the blog it looks great. Look forward to all the new recipes to come! This looks like a family friendly meal! I know my husband would Love this dish! I will have to make it for him. Thanks!